I was able to keep or giveaway the swag I received. I gave away most of the swag to friends and family. I do want to highlight some of my favorite brands or brands that just caught my attention. 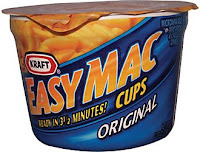 Kraft Easy Mac. You just add water. It is ready in 3 1/2 minutes. My son loves mac and cheese. These cups are so easy. Now that my son is back in school, we keep these in our pantry. Softlips. New Softlips® Pure is 100% natural and USDA certified 95% organic. Read my lips-LOVE IT! Enfamil is the brand of milk I gave my son, 10 years ago. I was amazed by all the new developments in baby formula. Enfamil® PREMIUM™ with Triple Health Guard™ Only Enfamil PREMIUM has Triple Health Guard — clinically proven* to promote growth, to improve** brain and eye development, and to support the immune system too. Since I don't have a baby in my house, I gladly passed all the baby products to my bestfriend who just had a baby boy on July 30. Baby Daniel was 9lbs, 11oz.